Greetings to all and welcome to our new blog. There has been an incredible amount of interest in the Novint Falcon, so we've decided to create this forum to let you know about what we're up to, and as a place to discuss 3D touch, gaming, and, of course, the Falcon. If you haven't visited our web site lately (www.novint.com), take a peek at the great press we've been getting, or pick-up copies of the July issues of PC Magazine and Computer Gaming World, which both have nice articles on the Falcon. We're still basking in the success we had at E3. For a small company, hidden away in Kentia Hall, I think we had more traffic, per square feet of booth space, than some of the mega-companies in the humoungous South and West Halls. Our Half-Life2 (Haptics-Life2) mod was a big hit, converting traditional FPS players and non-players alike. We can't wait to get an audience with Valve, to show them how much 3D touch adds to the game. If there are any Valve folks out there reading this, lets talk. Winning IGN's Best of E3: Gear Award was the icing on the cake. Being recognized in a category that included the Nintendo Wii-mote, a Sony PS2, and PS3 controller, validates what we've been working towards since the start of the company. Seeing the anticipation and support of the media and game community is truly rewarding. It is amazing how excited everyone is about the Falcon, and nice to know that innovation is still recognized and appreciated. Thanks for your interest in Novint. We look forward to an ongoing dialog. Can't wait to see some new content on the Novint. Will be keeping an eye out here for any new progress/information. I can't wait to get shot using this thing!! What games are going to be compatible with this thing? It seems a little clunky. Is it easy to use? Are there any details available on this? Is it "real"? "For most gamers, the first truly sophisticated haptic controller will be the Novint Falcon...It got rave reviews when it was demoed in May at the E3 computer games expo in Los Angeles." "Force-feedback game controllers are nothing new, but we're smitten with the Novint Falcon..."
"My hands-on time with the Falcon was nothing short of mind-blowing. Even the simplest game became mesmerizing with the technology of the Falcon." "I recently had a hands-on experience with the Novint Falcon, a completely new interface device from Novint Technologies - and was absolutely blown away, damn near left speechless." "The Novint Falcon is one of the most promising PC interface peripherals to come along in years...Were the Falcon simply one of the most intuitive 3D controllers ever produced, that would be appealing enough, but the product also incorporates sophisticated haptics or advanced force-feedback..."
"The Nintendo Wii made a big splash at E3 this year, and its motion-tracking controller has suddenly pushed innovative control mechanics into the forefront of what's hot in gaming. While we are fans of going through physical motions to play games with the Wii, Novint Technologies opened our eyes to what it's like to actually feel a game...We were blown away and can hardly wait for Novint to make good on their promise to launch the Falcon in 2007..."
"Coolest Thing At E3...It's not Spore. It's not the Nintendo Revolution. It's not the Burning Crusade. The coolest thing at E3 was way down in the bowels of Kentia Hall, made by a company we'd never heard of: Novint Technologies. It probably had the biggest crowd of all the little booths up and down the cramped aisles of Deep Kentia..."
"Think the Wii's remote is innovative? Get ready for haptic (3D touch) that'll blow your mind." What are the possibilities of internet use? When will we see any screen shots or information about the "future touch-enabled games"? I'll try and address all of the questions. First, yes, the Falcon is real and it is very easy to use. You just plug it in (it is a USB device), grab the handle, and away you go. We've been doing demos at trade shows and industry events and, as one poster pointed out, getting great response from the media, and pretty much everyone who tries it. With regard to our touch-enabled games, we haven't officially announced any titles yet (stay tuned), but I can tell you that we're working on an original collection that includes a lot of fun and really addictive microgames. We showed a Cell Factor demo at E3, and we've also developed a Half-Life2 mod (Haptics-Life2) that truly demonstrates the power of the technology and how much it adds to the game experience. Of course, I can rave about how cool it is forever, but at the end of the day you really need to experience it to grok it. I think that is why the reviews have been so incredible. You'll notice that many of them include the words "mind blowing." Well, once you feel it, we're guessing you might have the same reaction. So when will be able to try it out --or purchase-- the Falcon for ourselves? The time-to-market date moves ever further out. Can't there be a demo at a local CompUSA's, Circuit City, Best Buy....I would assume that would limit your ability to sell direct over the internet, if that is your intent. What does the "565" stand for on the novint blog home page? 565 days until the relase of this thing? Nice idea to add a blog to describe Novint's activities! I look forward to future updates. 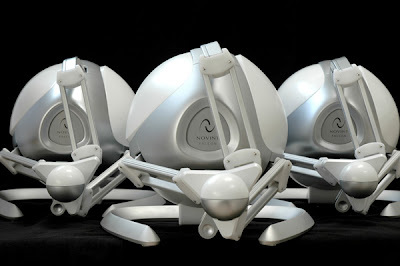 From the press Novint has received, its apparent the Falcon is generating a lot of buzz. Can you provide us with an approximate time frame for the release of the Falcon? There's a lot of talk about virtual worlds on the internet (i.e. Second Life). Are there plans to make the Falcon compatible with this sort of application? We haven't formally announced a release date, but expect to start shipping units in the first half of 2007. In addition to preparing the hardware, we are busy ensuring that there will be great 3D touch games available. As for demos, one of the things we're considering is a cross-country tour that will let people try the Falcon and test drive some of our games. I don't have any details yet, but would love to hear people's thoughts and interest in attending a Falcon tour event. With regard to the 565 in the blog, I wish I had a wonderful story to tell you about its origin but, in fact, it is just a design element that is part of the blogger software. Hey Novint supporters, go digg this blog on digg.com....!! I am really looking forward to this device, since I think haptics can add a new dimension to gameplay indeed. What I am wondering though is if there will be some sort of development kit available for small or even homebrew developers, so the device can be used by parties orther than large professional studios. I believe there are many possibilities using haptics, that can be made by students, free artists, non-commercial 3D applications (ie. in musea), etc. that otherwise will never see daylight. Maybe some sort of license like Ageia is using for its PhysX engine could be possible? I like the idea of a demo tour. You might want to consider showing up at game tournaments to let gamers demo the Falcon to a modded game like Half-Life or whatever game is being played at the tournament. I agree with Jorrit's post...a developer's kit would be another good way of reaching out to consumers other than the gamers. Great idea, Jorrit. We are, in fact, developing an API for the device, but we haven't released too many details about it yet. I'll keep you posted as soon as I can. Also, nice idea about tournaments. These might be an interesting place to get feedback on the Half-Life game in particular. Also, profcells, thanks for the digg, btw. The Novint/Second Life idea, that is posted in your websites news section is very intriguing. After reading that article it would seem that Novint could set-up a virtual/real sales site right in cyber space. Truly Amazing!! How do you plan to market the Falcon to the public? When do you expect the Falcon to be sold to the general public? Hasn't the date been pushed back time and time again? The idea of using touch to enhance an online sales experience is definitely an interesting one. Being able to virtually touch the fabric of an article of clothing or test out a hand tool... these and other experiences could conceivably become part of a typical transaction. It's an intriguing idea. We expect the Falcon to be available to the general public in 2007. This forum should provide more specific release information as it becomes available, so check back here periodically if possible. Again, we appreciate the digg. Great Business Week article today. Thanks! Glad you checked it out. If you haven't already, view the article's slideshow by clicking on the link beneath the image of the Falcon at the beginning of the piece. It contains some additional information that may interest you. Are you guys going to have a booth at the Digital Life Expon in NY City in October? Saw you listed in the preview but didn't know whether the Falcon would be on display there. Why are you not going to the Digital Life? We don't want to get too many people worked up about the Falcon until they can actually buy one, so being at a consumer event in October might be frustrating for folks. Short answer is probably not at launch. The Falcon got its name because a falcon is a predator of the mouse. So we've definitely envisioned scenarios in which the Falcon (or its successor) becomes a replacement input device. In theory, it can do anything a mouse can do, but can do it better: in 3D, and with the inclusion of high-fidelity force feedback. We think the device has the potential to add tremendously to the overall human-computer interface, not only allowing users to navigate their desktops but also webpages, all using touch. This idea becomes even more compelling as the notion of 3D OS-navigation becomes more popular. That said, at launch we anticipate that the Falcon will be used primarily as a gaming device. Its other capabilities, we hope, will be unlocked as the number of Falcon users grows. We will not be in attendance, sorry. Have the specifications for the mass production model of the Falcon been finalized? design for the mass production model have been finalized, but all the details have not yet been made publically available. We can say, however, that the overall specifications for the Falcon on our website (http://www.novint.com/falcon.htm) are valid. complete and final specifications for the Falcon. Thanks for your input, tom I. This site contains statements that constitute “forward-looking statements.” Investors are cautioned that forward-looking statements involve risks and uncertainties that could cause actual results to differ materially from the statements. Factors that may cause or contribute to such differences include, among other things, our technology becoming obsolete, consumers not purchasing our products, changes in business conditions and the economy in general, unforeseen litigation and other risk factors identified in the Company’s annual report on Form 10KSB filed with the Securities and Exchange Commission. The Company undertakes no obligation to update these forward-looking statements for revisions or changes after the date of published press releases.